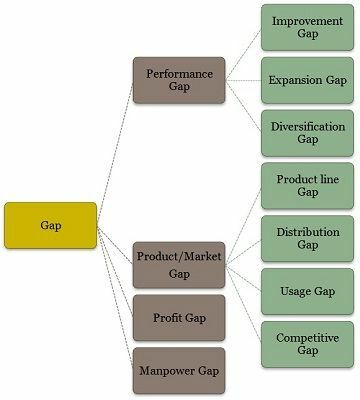 Definition: Gap Analysis can be understood as a strategic tool used for analyzing the gap between the target and anticipated results, by assessing the extent of the task and the ways, in which gap might be bridged. It involves making a comparison of the present performance level of the entity or business unit with that of standard established previously. If the gap is narrow, stability strategy is the best alternative. However, when the gap is wide, and the reason is environment opportunities, expansion strategy is appropriate, and if it is due to the past and proposed bad performance, retrenchment strategies are the perfect option. Performance Gap: The difference between expected performance and the actual performance. Product/Market Gap: The gap between budgeted sales and actual sales is termed as product/market gap. Profit Gap: The variance between a targeted and actual profit of the company. Manpower Gap: When there is a lag between required number and quality of workforce and actual strength in the organization, it is known as manpower gap. For different types of gaps, various types of strategies are opted by the firm to get over it. Redefine the objectives: If there is any difference between objectives and forecast, first and foremost the company’s top executives need to check whether the objectives are realistic and achievable or not. If the objectives are intentionally set at a high level, the company should redefine them. Do nothing: This is the least employed action, but it can be considered. 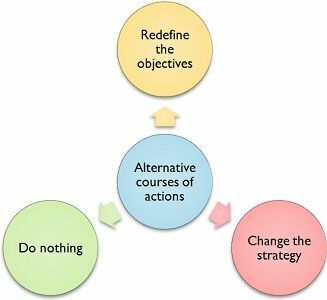 Change the strategy: Lastly, to bridge the gap between the company’s objectives and forecast, the entity can go for changing strategy, if the other two alternatives are considered and rejected. Before making any change in the strategy, one must consider that the gap exists between the present and proposed state of affairs. It is too wide to be noticed, and the organization is encouraged to reduce it. The company’s management is of the opinion that something can be done to reduce it. Ascertain the present strategy: On what assumptions the existing strategy is based? Predict the future environment: Is there any discrepancy in the assumption? Determine the importance of gap between current and future environment: Are changes in objectives or strategy required? Whether it is anticipated sales, profit, capacity or overall performance, they are always based on the past, and present figures and some amount of guess are also involved in it. So, the occurrence of the gap is quite natural, but if the gap is large, then it is a point to ponder because it might have an adverse affect on the company’s future. First of all I want to thank you for this enlightening, but my question is, a situation where the gap does not affect the organization negatively, should the gap be filled?